Cottage is overlooking Lake Michigan located in Glenn, Michigan-- Private Lake Frontage! 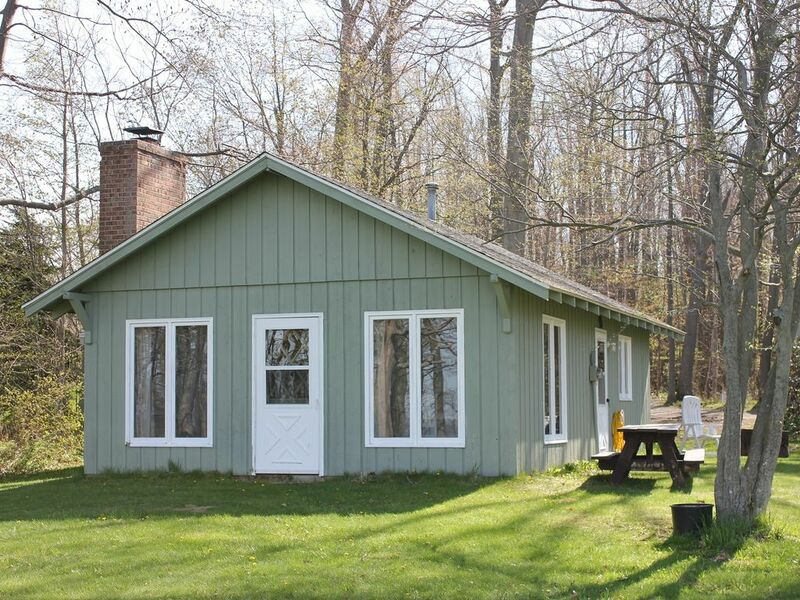 The Cottage in the Glenn is perfectly situated in the quaint four-cornered 'Pancake Town' of Glenn, Michigan, between South Haven (10 miles) and Saugatuck (6 miles). The completely remodeled 3 bedroom/1 bathroom cottage will sleep up to 6. Enjoy your morning coffee overlooking the lake or just relax with a good book and watch the sunsets in the evening. The private sandy beach is a swimming beach with ever-changing sandbars. Amenities:: Beautiful Sandy Private Beach on Lake Michigan. Activities: Plan a Weekend Away! Enjoy Shopping and Dining in Quaint South Haven or Saugatuck! Enjoy our wood fire pit. Bring your own wood or search for wood in our woods! Remember to bring your own bath and beach towels and beach chairs. Other Activities: The Cottage in the Glenn is located in between South Haven and Saugatuck-Douglas. You have your choice of many fine dinig restaurants, wineries, antique shops, art galleries, theaters and shopping. Enjoy an evenings walk along the boat docks after dinner in Saugatuck and South Haven. Fennville is just a short drive away where you can go to the famous 'Crane Orchard' for lunch or pick in season fruit. Salt of the Earth restaurant in Fennville is another great restaurant. Michigan has many festivals such as the National Blue Berry Fest, Tulip Fest, the Maritime Tall Ships sailing, Venetian Night and waterfront Film Festivals. Don't forget to visit Sherman Dairy in South Haven for the best ice cream cone yet! Their scoops of ice cream are the largest I've ever had! In Glenn, visit Earls Farm Market or Dee's Farm for fresh fruit and vegetables.